CAPE TOWN — The Department of Communications will submit the set- top box manufacturing strategy and the subsidy scheme for poor households to the Cabinet in August, with the preferred producers expected to be appointed by November. This was announced by Communications Minister Roy Padayachie during his maiden budget-vote speech in Parliament yesterday. SA is moving from an analogue broadcasting signal to digital, and the government plans to switch off the analogue signal in December 2013. The market has been waiting for clarity on the manufacturing plan, with some companies already positioning themselves to benefit from the project. Broadcasters have been testing the new digital signal, based on the European technology known as digital video broadcasting-terrestrial 2 (DVB-T2). "We are consulting widely with industry and relevant stakeholders towards finalising this process," Mr Padayachie said. "This will pave the way for us to select the preferred set- top box manufacturers for the subsidised market by November 2011 and deploying the necessary infrastructure for the distribution of the subsidised set-top boxes." He said the department has also established a dedicated migration project office because of the "complexity and the magnitude of the digital migration process". It would be located in the communications department and would drive the digital terrestrial television plan. The minister said state-owned signal distributor Sentech had met its March deadline to achieve 60% digital TV broadcasting population coverage and would this month switch on the first DVB-T2 test transmission at the Brixton tower in Johannesburg, targeting townships and informal settlements in the Johannesburg metropolitan area. The uptake of digital broadcasting technology will expand the public offering in content viewing. For example, it will see an increase in the number of channels from the current three SABC channels to more than 10. The Treasury earlier this year allocated R279m to Sentech for digital terrestrial television. Of the R279m allocated for the 2011-12 financial year, R120m will be dedicated to cover increased operational expenditure during the dual illumination period — when both analogue and digital television signals will be broadcast. Mr Padayachie said a successful trial conducted by broadcasters and the signal distributor had demonstrated SA was ready for migrating from analogue terrestrial television to digital terrestrial television using the adopted DVB-T2 standard. 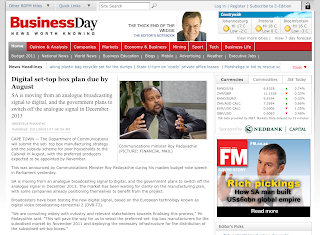 "We expect the South African Bureau of Standards to finalise the second generation DVB-T2 standard during the last quarter of 2011," Mr Padayachie said. "By end 2012, Sentech will have upgraded the existing infrastructure to DVB-T2, to cover 80% of the population. We intend to achieve 100% population coverage by the end of 2013 to enable analogue signal switch-off," he said. Communications portfolio committee chairman Sikhumbuzo Kholwane said the committee was pleased Mr Padayachie had placed emphasis on the use of "ICT (information and communications technology) in national development as a driver of the economy". "ICT infrastructure is being recognised as a necessary utility — without which 21st-century SA will not reach its full potential and will also become less competitive," Mr Kholwane said. Democratic Alliance member of Parliament Natasha Michael welcomed Mr Padayachie’s speech and said the department had "done a 360 degree turn since he took over". She also welcomed the appointment of Rosie Siskesie as director-general.